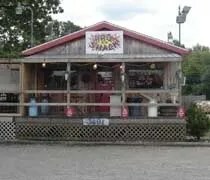 FYI, the BBQ Shack has moved since this review. Click on the website link to get the new location. What a find! I actually read a review from another blogger about a week ago. I’m doing some freelance work again this weekend at Michigan International Speedway and figured one of the days, I should have some time to stop on the way home and check it out. J and I headed down to the Irish Hills for media availabilities on Friday morning. We sat in on Jimmie Johnson and Jeff Burton’s press conferences and the Stewart-Haas Racing announcement of Ryan Newman joining the team next year. After that, we did a quick lap through the pits as guys were getting ready to practice. All that worked up an appetite so we decided today was the day for BBQ. Well, it is Memorial Day and pretty much everyone, including me, fired up the grills for lunch. I stayed away from anything that needed sauce, but the Lansing State-Journal stirred up the debate in this morning’s paper. The core of the barbecue sauce debate is simple: vinegar-based vs. tomato-based. It’s strictly a Southern squabble, the battle line starting with the vinegar crowd in eastern North Carolina. As you move west, tomatoes take over. And the closer you get to Texas, the sweeter and darker red the sauces get. But for non-Southerners, it’s hard to understand the fuss over a sticky substance spread over a chunk of meat. It’s not strictly for Southerners. I hate when I see people drowning ribs in a Kansas City style sauce. My preference is actually somewhere between vinegar and tomato based. I use a sauce similar to what Neely’s BBQ in Memphis uses. It is a tomato based sauce heavy on ketchup (which is vinegar based itself), but I add a lot more cider vinegar. I probably double or triple their recipe. I like the sweetness of the ketchup, but I really like the tanginess of the vinegar. Memphis BBQ joints really showcase the differences in sauce. There’s Neely’s which uses a thin tomato based sauce. Rendezvous uses a traditional southern vinegar mop sauce made up of pretty much just vinegar and pepper. Then Corky’s uses a thicker tomato based sauce. Once you reach the Memphis region and beyond, your starting to get more variety. Sweetness starts to take over from tangy and brown sugar, molasses, and honey start getting added. Keep going west to Kansas City and you’ll run into a totally different animal. KC Masterpiece is the standard as far as Kansas City sauces go. Really think tomato based sauces that are really messy. Head south to Texas and your somewhere in between Memphis and KC. I would suggest reading the LSJ article for a detailed explanation of the different regions. And just think, we’re JUST talking about sauce here. We haven’t scratched the surface as far as BBQ. There’s the ribs vs. chopped pork vs. pulled pork vs brisket debate. There’s baby backs vs. spare ribs or St. Louis ribs. There’s secret rubs….and everyone has a strong opinion either way. For me, heaven is a rack of baby backs with a chili pepper based rub with a thin, vinegary, tomato based rub. No matter what, I’ll take great BBQ, whether it’s mine or someone elses, over a salad anyday.